Beat the heat this summer with the ALL NEW “Cactus Springs” at Funtasticks Family Fun Park in Tucson, Arizona. 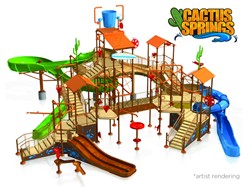 Funtasticks Family Fun Park in Tucson, Arizona, which is owned and operated by ProParks Management of Orlando, Florida has announced the addition of Cactus Springs interactive waterplay attraction to the property set to make its first “splash” late June 2018. Cactus Springs water play structure has multiple levels, features colorful water slides and multiple gigantic tipping buckets that dump 1,000 gallons of water every 10 minutes on funseekers at the park. The new structure also has bubbler jets, water wheels, water curtains, and waterfalls which are all perfect for children and families to enjoy together.